If you’ve been trying to collect the three Olympic Winter Moments coins in your pocket change, but have only come up with the Men’s Hockey coin, you might look again starting this week. 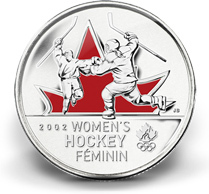 The second coin, celebrating the 2002 win in Women’s Ice Hockey, has just been released into circulation. The third coin, depicting 2006 gold medal speed skater Cindy Klassen, is set for release January, 2010. Of the twenty-two million Moments coins entering circulation, three million will be in colour, and may only to be found by chance, randomly distributed across Canada. A Special Edition Uncirculated Set containing nine coins, including all three coloured Moments coins can also be purchased at www.mint.ca. The Olympic Winter Moments coins, designed by our principal, Jason Bouwman, are the most recent coins he has designed for the Royal Canadian Mint. Last summer, I was asked to spend a couple of days at Campfire Bible Camp teaching a crash course in photography to a group of teenagers.